Last week I gave you yummy pumpkin recipes and this week I found some really cool Halloween recipe crafts to do with the boys. 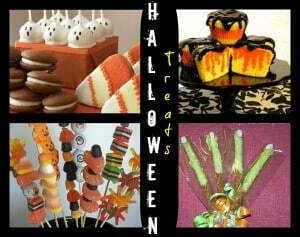 Do you have any traditional food or snacks that you make for halloween? I would love to see them. Would you make any of these that I have above? Be sure to link your Pinterest Halloween Faves or other favorite pins up at 3 Boys and a Dog, Crystal and Company, or Susie QT Pies! Hey girl! Thank you for sharing our witchy pretzel fingers! You rock! Thank you, Kelli for sharing our Halloween Recipe Post! You will find a lot of great ideas there!